First US Army advises, assists and trains Reserve Component units during pre-mobilization periods. 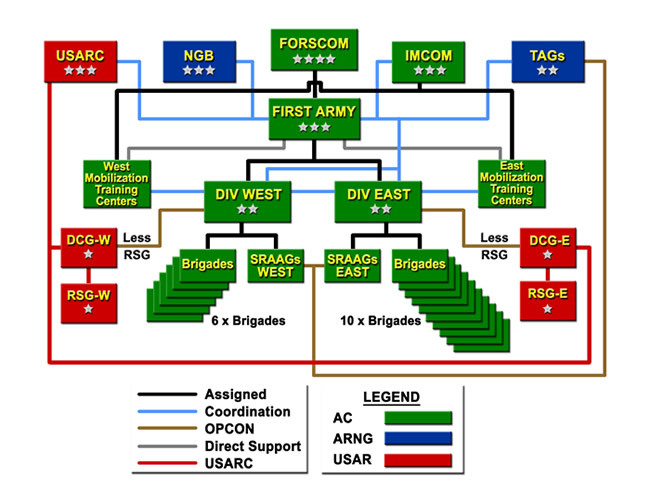 It also conducts mobilization, training support, readiness validation, and deployment of alerted forces; executes demobilization of Reserve Comopnent forces in accordance with Department of the Army and FORSCOM directives and provides trained and ready forces in support of the Army Force Generation (ARFORGEN) model. As directed, First US Army provides training to Joint, Combined, Interagency and Active Army Forces. Along with the training mission, First US Army had a military support to civil authorities mission for many years. This meant that First US Army planned for and provided personnel for Department of Defense support to domestic disasters ranging from hurricanes to floods to fires to terrorist attacks. In 2001, after the terrorist attacks on the World Trade Center in New York and the Pentagon in Washington, First US Army defense coordinators, and their cells provided Department of Defense support during relief efforts. The years 2004 and 2005 marked not only the busiest training load for First Army, but also record hurricane seasons, culminating when Katrina and Rita ravaged the Gulf Coasts of Alabama, Mississippi and Louisiana. First US Army commander, Lieutenant General Russel L. Honoré was named Joint Task Force Katrina commander and First US Army was given the mission to coordinate the command and control of all Department of Defense assets for relief efforts. In all 72,000 active-duty, National Guard and Reserve members from all services responded to relief efforts on the Gulf Coast following Hurricane Katrina in 2005. By the mid-2000s, First US Army was transforming along with the rest of the US Army, to support Army Force Generation (ARFORGEN) and continue the mission to train, validate and deploy Reserve Component units. The Army was undergoing the most comprehensive transformation since World War II and in an era of persistent conflict the America's Reserve Component forces had transitioned from a strategic reserve to operational forces that mobilized as part of the ARFORGEN cycle for routine periods of employment and potential contingency operations. First US Army's legacy training support strategy, organizational design, and infrastructure were based on the Army's Training Support XXI mission, and were developed prior to the realities of constant mobilization of Reserve Component forces that came after the terrorist attacks on 11 September 2001. The training support was based on providing regional pre-mobilization training support to 16 Enhanced Separate Brigades and other Army National Guard and Reserve units. As the Army National Guard transitioned to modular brigade combat teams like the Active Component and the Army Reserve also tranformed, the Reserve Component became an operational reserve requiring cyclical pre- and post-mobilization training support to prepare the units for deployment. The Army's transformation necessitated restructuring the roles and missions of First and Fifth US Armies to support reserve component modularity and ARFORGEN. First US Army's training mission expanded on 16 January 2006 to include training, readiness oversight and mobilization for US Army Reserve and National Guard units throughout the continental United States and 2 US territories. The transition of the expanded geographic mission began in mid-December 2005 with the transfer of authority between First US Army and Fifth US Army for the Western United States. Previously, First US Army trained, mobilized and deployed US Army Reserve and National Guard units in the eastern United States, Puerto Rico, and the US Virgin Islands. Fifth US Army at Fort Sam Houston, Texas, assumed the Defense Support to Civil Authorities responsibility nationwide and was redesignated as US Army North (USARNORTH), the US Army component command assigned to US Northern Command (NORTHCOM). First US Army had also previously conducted Homeland Defense in support of national objectives as well as providing Department of Defense support of civilian authorities, such as relief efforts after Hurricane Katrina. First US Army took on the task of mobilizing, training, validating, and deploying Reserve Component units in accordance with combatant commander, Department of the Army, and FORSCOM directives. As directed, it would provide training to Joint, Combined, and Active Army Forces. Soldiers would train at one of 10 Mobilization Training Centers to support the War on Terror (later referred to as Overseas Contingency Operations) and other contingency operations. In its new role, First US Army continued to report directly to FORSCOM at Fort McPherson, Georgia, and formed 2 subordinate multi-component headquarters: one training division in the western United States and one training division in the East. When established, these 2 divisions supported Reserve Component training, readiness and mobilization. Additionally, each western state's senior Army advisor to the Army National Guard; the 75th Training Support Division in Houston, Texas; and the 91st Training Support Division at Camp Parks, California; were reassigned as part of First US Army. The western divisions joined with the 78th Training Support Division in Edison, New Jersey; the 85th Training Support Division in Arlington Heights, Illinois; and the 87th Training Support Division in Birmingham, Alabama, already assigned to First Army. The Reserve training divisions were subsequently restructured into a variety of training commands and assigned training divisions, assigned to the US Army Reserve Command. First US Army's 2 divisions contained 16 training support brigades consisting of 103 Active and Reserve Component training support battalions operating at 10 Mobilization Training Centers. The brigades and battalions conducted post-mobilization training for all Reserve Component forces deploying in support of contingency operations and also trained service members from sister services deploying to support traditional Army missions. With the majority of First US Army units assigned to locations other than the MTCs, many of its soldiers had either been on temporary duty or had a temporary change of station, for as many as 270 days a year, for 4 consecutive years. This CONUS "deployment" while assigned to First US Army was a significant quality of life issue and placed stress on the soldiers' families. Furthermore, many of the facilities where First US Army's 12,000 soldiers and civilians worked were also temporary or outdated. Because of the changing training environment, First US Army initiated a comprehensive organizational transformation to permanently reorganize and re-station units and trainers at the MTCs where they trained and operated. It was nested within the Army Campaign Plan to position First US Army to meet the future challenges of mobilization training for persistent conflict and it was synchronized within the ARFORGEN process. Organizational transformation began in early 2008 with the re-stationing of 4 training support brigades and 5 training support battalions to where they were already operating at Camp Atterbury, Fort Bliss, Fort Hood, and Fort Dix. This move immediately increased the quality of life for assigned personnel, and also reduced TDY and TCS costs. Using existing facilities reduced the re-stationing costs and allowed for rapid unit movements. This portion of transformation was expected at the time to continue through 2012 as other units were moved to their training locations. As part of transforming its infrastructure, First US Army would consolidate training at fewer MTCs in order to focus its expertise and resources. These MTCs would concentrate efforts on specific mission sets required for the existing fight, while maintaining the ability and flexibility to support any mission that the Army or combatant commanders might require in the future. For example, aviation training would be focused at Fort Hood, Texas and detainee operations would be focused at Fort Bliss, Texas, but First US Army would retain the flexibility to train these missions wherever and whenever needed. The third portion of the transformation strategy was to transform the training support strategy. The units were arriving at the MTCs better prepared than they were before. The entire training process had improved and the units did not have to start from scratch. Their soldiers were experienced and many had deployed multiple times. First US Army would continue to gather feedback from theater on the latest tactics, techniques, and procedures using the network of liaison officers throughout theater. This information was used to adapt and adjust training for the deploying units. As the operational tempo changed, First US Army would return to training for full-spectrum operations. The MTCs would be capable of providing a combat training center-like experience for Reserve Component forces during their mission readiness exercises and command post exercises. It was an ambitious plan, but one that benefited the Army by enhancing the post-mobilization training to a "CTC-like" experience. 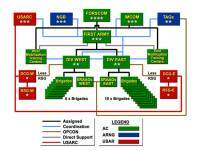 It also reduced operating costs because of brigade/battalion consolidation at fewer MTCs. More importantly, it benefited the individual soldier and the soldiers' families because they would have more time together and more predictability to their assignments and deployments. The First US Army transformation end-state would be well-resourced, mission-focused training executed at enduring MTCs, allowing divisions and modular/functional brigades and forces required by the combatant commanders to operate within ARFORGEN cycle while conserving considerable Army resources.